Teri and Phil slowly walk towards the Bauer house. Myovic is nearby holding a gun. Teri enters the house and the security system goes off. A person calls from the security company. Myovic flees the area. Drazen’s contact is pronounced dead at the plaza. Nina finds out that the man who met with Jack was named Alan Morgan. Nina says that Morgan was a power company worker who was being paid by Drazen to shut off the power in an empty field. Nina names the coordinates for the power grid. Two security guards turn off the Bauer’s security system. The guards ask if Teri is okay. The four enter the living room. Teri stops to look at family photos. The guard asks Teri to sign a form. The guard explains that they will be resetting the alarm. Teri thanks the guard. Myovic is watching from another yard. George shows up at the plaza. George is mad that the contact is dead. 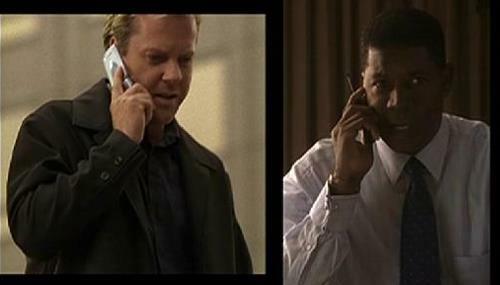 David calls Jack. David says that he called the Pentagon to retrieve the missing file. David gives Jack an address which he instantly recognizes. Jack calls Tony. Jack says that the address is in the vicinity of the coordinates that Nina described. Jack tells George about it. George is resolute that he is coming with Jack. Frank wants the money for the drug deal. Rick doesn’t tell him the truth about Dan. Kim wants to find Teri. Melanie inquires about Dan. Frank points a gun at Kim. Frank is shocked when Rick blurts out that Gaines killed Dan. Frank wants to know about the money, but Rick admits that they didn’t get paid. Frank is worried that they will have no money for the drug deal. At the suite, the Palmers sit down for dinner. Sherry is mad at Keith. David defends his son. David confronts Sherry on her disloyalty. Sherry yells at Keith for continuing on about the cover-up. Keith is shocked that his mom wants to hide the truth. Nicole begins to hyperventilate, which concerns David and Sherry. They alert the doctor. Nicole apologizes. Nicole feels guilty for everything that’s happened. Nina calls Jack and says that the address is located in a wildlife refuge. Jack thinks that is strange because Saugus is an industrial area. George goes over the information with Jack. George can’t believe that the day’s events stem from a personal vendetta against Jack and David. Jack apologizes for shooting Mason with the tranquilizer gun earlier in the day. Teri goes into Kim’s bedroom. Phil asks if she remembers anything. The doctor puts on some music to help trigger some memories. Teri asks about Jack and Kim. Teri admits that she can’t remember Phil. Phil holds Teri’s hand. Frank makes a call. Kim is antsy and wants to go find her mother. A man shows up before Kim has a chance to leave. Frank’s friends bring in an arsenal of guns. Nicole calms down. David thinks that his family is being tested. David affirms that they’ll get through the crisis. David asks Sherry to be strong for their family. David prepares to face the press. Teri looks through an appointment book, but the information means nothing to her. Dr. Parslow talks about Teri’s life and implies that they had an intimate relationship. The doorbell rings. Phil thinks it is his friend Chris. Teri notices Chris’ gun and panics. Phil assures Teri that she shouldn’t be scared. The doctor thinks that Jack might have assaulted Teri. Phil tells Teri to trust him. Andre calls Myovic. Myovic explains that he still needs to kill Teri. Andre comments that he hasn’t heard from Alexis. David’s press conference is about to start. Carl and his associates are watching the conference. They are not happy. David announces that his campaign’s financiers are behind a cover-up. David reveals that he has handed over an incriminating tape to the Justice Department. David implores the men’s behavior. David emphasizes that Keith will turn himself in and be exonerated. David adds that the media should respect Nicole’s privacy during this difficult time. Nina finds out about the safe house. Nina is mad at Tony. Tony says that George gave the word to stay quiet. Nina feels bad for leaving Teri and Kim. Nina wants to call Jack. Nina calls George, but he insists on not telling Jack about the safe house. George ignores Nina. George asks to use Jack’s phone. George blocks all calls coming from Nina. Jack and George arrive at the Saugus address. Jack is using a GPS device to find the exact coordinates. Mason and Jack talk about the Drazens. George thinks that the Drazens have to be working with others. Jack finds a power transformer with a new lock. Jack senses that the wildlife refuge is just a front for something else. Frank and his friends wait for the drug dealers. Rick and Kim sit in the living room. Frank wants to do business. The leader asks to see the money. He produces the drugs. Frank shows the man a black bag. Frank grabs a gun out of the bag. All of Frank’s friends are suddenly aiming their guns at the drug dealers. Frank asks the leader to drop his gun. Frank hits Rick for allowing Dan to die. Nina is calling hospitals looking for Teri and Kim. Tony doesn’t think that the Drazens found the Bauer women. Nina asks about the Bauer residence. Nina comments that Tony isn’t doing enough to protect Jack’s family. Frank threatens to kill the drug dealers if he runs into them again. The leader announces that he is a cop and that they are all under arrest. The SWAT team comes in and arrests everyone. Kim is shocked. David continues to speak to the media. The press wants to ask questions after the conference, but David ignores them. In private, Keith tells David that he loves him and vice versa. Phil shows Teri the pictures of his children. Phil leaves the room to get them some tea. Teri picks up a trinket box that Kim made. Teri announces that she is remembering something. Chris and Phil walk into the room just as Myovic shows up. Myovic shoots the two men. Teri starts to cry. Myovic asks about Kim. Teri doesn’t know where she is. Suddenly, Myovic is shot from behind by Tony. Teri is a nervous wreck. Jack and George continue to use the GPS device. They notice a chopper go by. Jack thinks that someone knows they are there.